Welcome to Mgahinga National Park, a complete guide for visitors with everything you need to know about the Mgahinga Gorilla National Park in South West Uganda. Our aim is to provide free and inspiring advice to help you plan an amazing experience in Mgahinga National Park. Whether you are looking at gorilla trekking in the park, hiking the Virunga Volcanoes, golden monkey tracking, you will find all the information to plan your trip. Find information about the park, things to see (attractions), things to do (activities) and a travel planner to help you plan a perfect gorilla safari to Mgahinga Forest. Our exclusive safari planner section has detailed information on planning a gorilla trek, when to go, gorilla permits, how to book your safari, where to stay and more! 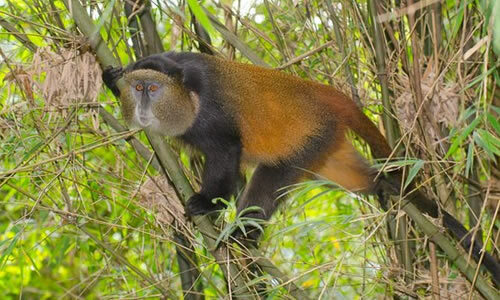 At just 33.7km2, Mgahinga National Park is Uganda’s smallest national park. 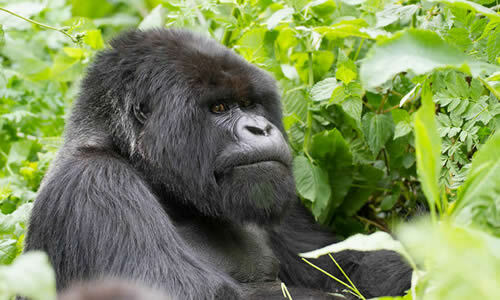 Mgahinga Gorilla National Park is located in the southwestern corner of Uganda. 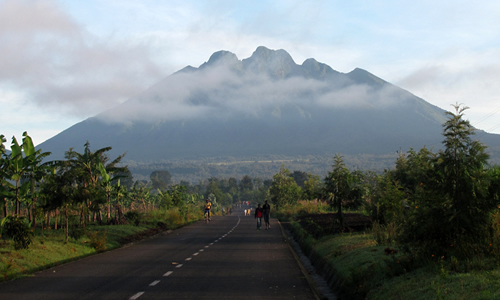 The Park covers the northern slopes of the three northernmost Virunga Volcanoes: Mt. Muhavura (4,127 m), Mt. Gahinga (3,474 m), and Mt. Sabinyo (3,645 m). The Park is about 10 km south of Kisoro and is bordered to the south by the Volcanoes National Park of Rwanda and to the west by the Virunga National Park of the Democratic Republic of Congo. 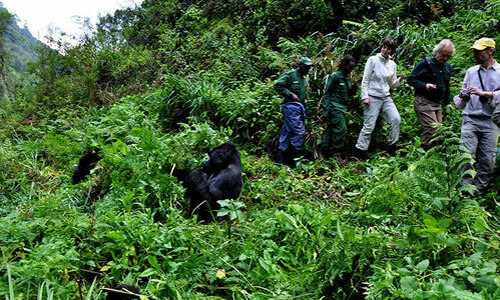 The park is part of the larger Virunga Conservation area that spreads over the three countries. 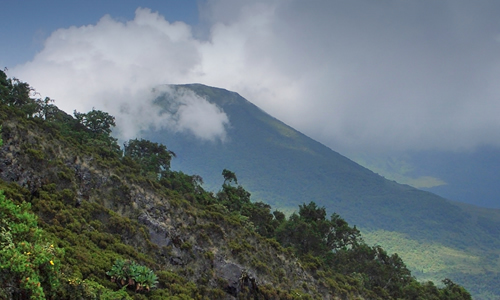 Each of these countries protects its own portion of the Virungas, in the Parc National des Volcans and Parc National des Virunga respectively. The three parks together form the 434-sq. km. ‘Virunga Conservation Area’ or VCA. Mgahinga is 33.7 sq. km, just 8% of the VCA. The entire Park is in Bufumbira County of Kisoro District. Mgahinga Gorilla National Park is 33.7 sq. 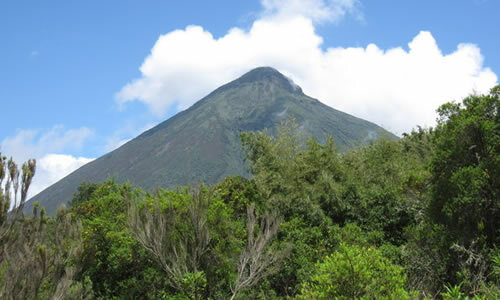 km and consists of the partly forested slopes of three extinct volcanoes. 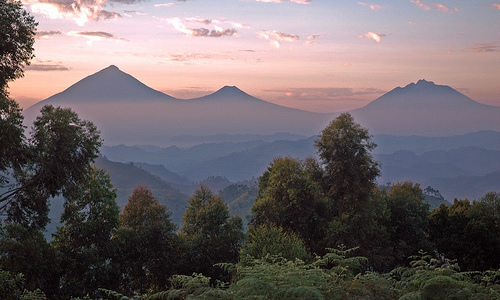 From far away, the huge cones of the Virunga volcanoes dominate the landscape and beckon you as you approach. When you reach the park you can get a great overview of the area by walking up the viewpoint, just 15 minutes from Ntebeko Gate. There are lots of things to do in Mgahinga Gorilla National Park. 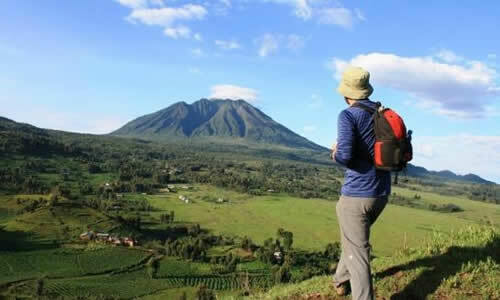 From gorilla trekking to Volcano Hiking, Mgahinga is such a place where you can engage in several adventure activities. Check out the full list of things to do in Mgahinga. The 342m long Garama Cave lies beneath a plateu northern edge of the park, 3km from Ntebeko. 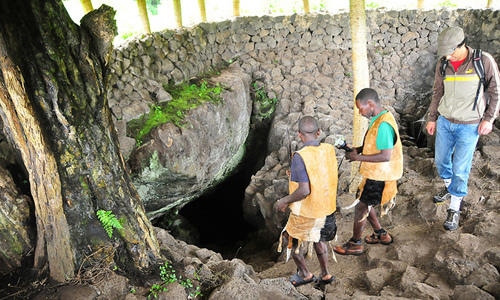 It is set in the former farmland zone but in earlier times, the cave forest when it was occupied periodically by Batwa who used it as a council chamber and a retreat. 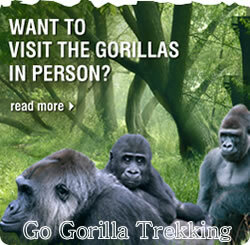 Planning to go gorilla trekking in Mgahinga National Park? Here is all the information you need to plan a perfect trip to see the endangered mountain gorillas within the park. Wondering about the best time to visit Mgahinga? The park experiences two rainy seasons; March-May and September-November. October is the wettest month, with 250mm of rain and July the driest with just 10mm. Where is Mgahinga National Park? Which entrance to Mgahinga Gorilla National Park should I take? Mgahinga Gorilla National Park has one main entrance for visitors and it is accessible from all directions. The Ntebeko gate is accessible from Kisoro Town and there is proper signage to the park headquarters. 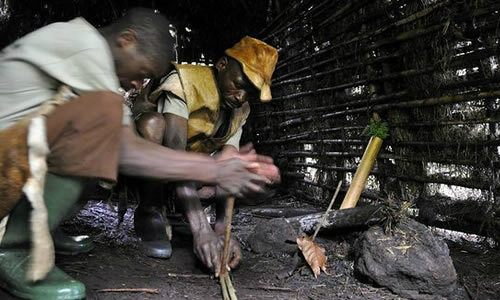 Most people travel on pre-booked Uganda safaris that are arranged by various tour operators. If you are looking to an independent trip, you should consider driving to to the park or using public transport as per our resource information. On this website, you can also check out our road trip ideas. Once you get to the park, you hike through the park on foot. Where should I stay on my Safari Vacation? 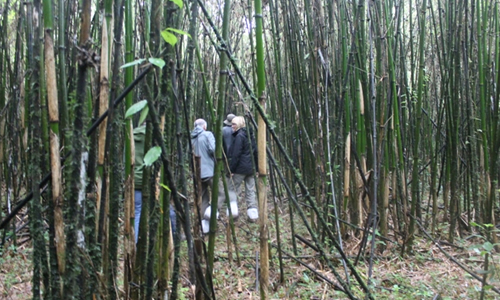 There are several campgrounds, hotels and lodges around Kisoro and Lake Mutanda Area. There are no developed lodging facilities inside the park. There are various lodging options near the Ntebeko’s entrances. Depending on the season, you will need to reserve hotels and campgrounds well in advance. What animals will I see in Mgahinga National Park? 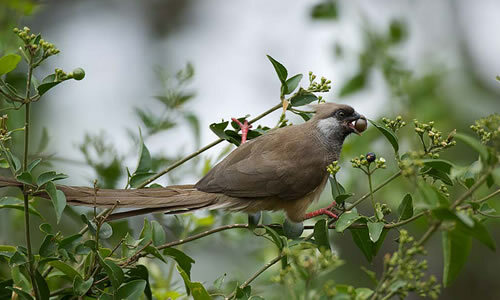 There are several animals that have been recorded within the Mgahinga Gorilla National Park. Though gorilla trekking is the most popular adventure, there are several wildlife viewing activities that you can take within the park such as golden monkey tracking, buffalo viewing, bird watching etc. Check out our wildlife checklist for a detailed listing of animals that you can see in the region. Is Gorilla Trekking Good For Conservation?